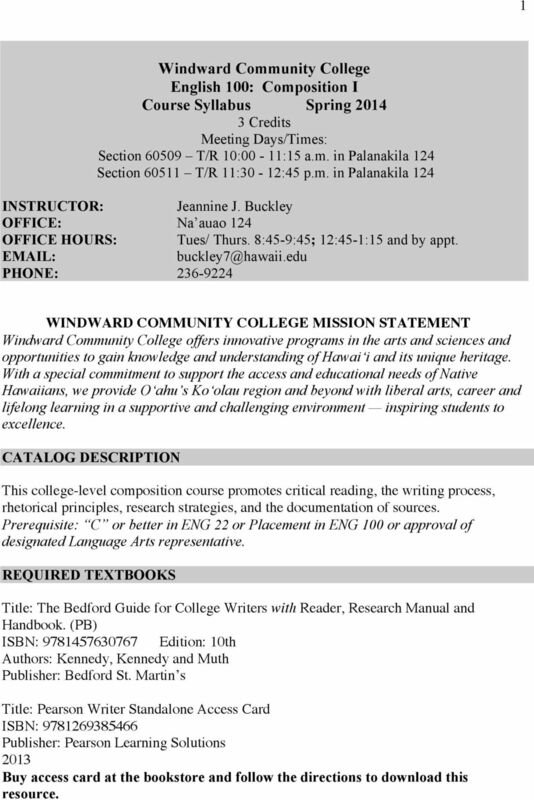 Download "WINDWARD COMMUNITY COLLEGE MISSION STATEMENT"
1 1 Windward Community College English 100: Composition I Course Syllabus Spring Credits Meeting Days/Times: Section T/R 10:00-11:15 a.m. in Palanakila 124 Section T/R 11:30-12:45 p.m. in Palanakila 124 INSTRUCTOR: Jeannine J. Buckley OFFICE: Na auao 124 OFFICE HOURS: Tues/ Thurs. 8:45-9:45; 12:45-1:15 and by appt. PHONE: WINDWARD COMMUNITY COLLEGE MISSION STATEMENT Windward Community College offers innovative programs in the arts and sciences and opportunities to gain knowledge and understanding of Hawai i and its unique heritage. With a special commitment to support the access and educational needs of Native Hawaiians, we provide O ahu s Ko olau region and beyond with liberal arts, career and lifelong learning in a supportive and challenging environment inspiring students to excellence. CATALOG DESCRIPTION This college-level composition course promotes critical reading, the writing process, rhetorical principles, research strategies, and the documentation of sources. Prerequisite: C or better in ENG 22 or Placement in ENG 100 or approval of designated Language Arts representative. 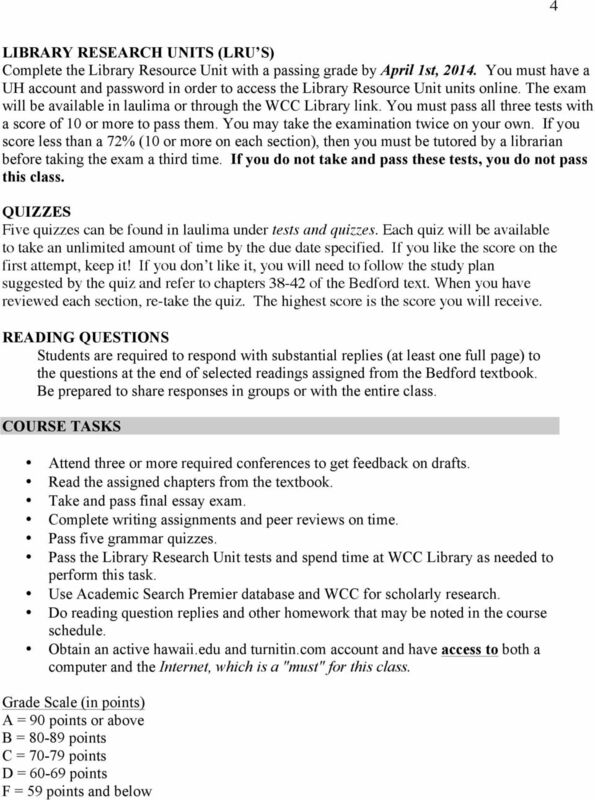 REQUIRED TEXTBOOKS Title: The Bedford Guide for College Writers with Reader, Research Manual and Handbook. (PB) ISBN: Edition: 10th Authors: Kennedy, Kennedy and Muth Publisher: Bedford St. Martin s Title: Pearson Writer Standalone Access Card ISBN: Publisher: Pearson Learning Solutions 2013 Buy access card at the bookstore and follow the directions to download this resource. 2 2 Required tools: Computer / Internet access (including access to laulima); Blue or black ink, a notebook; USB/thumb flash drive STUDENT LEARNING OUTCOMES Upon successful completion of English 100, students should be able to complete the following as independent learners. The student learning outcomes are: Write complex and well-reasoned compositions in language, style, and structure appropriate to particular purposes and audiences. Engage in a writing process that includes exploring ideas, considering multiple points of view, developing and supporting a thesis, revising with the help of peer and instructor feedback, editing, and proofreading. Find, evaluate, integrate, and properly document information from libraries, the Internet, and other sources, with an eye for reliability, bias, and relevance. Read for main points, perspective, and purpose, and analyze the effectiveness of a variety of rhetorical strategies in order to integrate that knowledge into their writing. WRITTEN COMMUNICATION HALLMARKS 1. Introduce students to different forms of college-level writing, including, but not limited to, academic discourse, and guide them in writing for different purposes and audiences. 2. Provide students with guided practice of writing processes -planning, drafting, critiquing, revising, and editing- making effective use of written and oral feedback from the faculty instructor and from peers. 3. Require at least 5000 words of finished prose-equivalent to approximately 20 typewritten/printed pages. 4. Help students develop information literacy by teaching search strategies, critical evaluation of information and sources, and effective selection of information for specific purposes and audiences; teach appropriate ways to incorporate such information, acknowledge sources and provide citation. 5. Help students read texts and make use of a variety of sources in expressing their own ideas, perspectives, and/or opinions in writing. ATTENDANCE Class attendance is mandatory. It is your responsibility to keep up with work you miss. Find out from your peer what was missed, such as announcements, assignments, handouts, etc., and be prepared by the following class. 3 3 Chronic absences, even if you have a good reason, will affect your grade. More than two absences will lower your grade. If you have six or more excused or unexcused absences, you may fail the course. Chronic lateness will also affect your grade in a negative way; three or more late arrivals will reduce your grade. COURSE INFORMATION The desire to write grows with writing. Erasmus Writing is a recursive process; it takes time and effort to develop good writing. It means taking risks and trying again and again. Think of yourselves as new writers rather than students merely getting a grade. Own your writing and don t be afraid to make mistakes. My aim is to help you achieve your goals in becoming effective writers so that you may succeed in your academic careers and in life. By learning the moves to academic writing, you will learn how to craft your own writing. I hope to foster a positive and exciting learning environment where we can engage in interesting discussions. My goal is to stretch your mind getting you to think deeper about issues in our world, how ideas are written, and how we react to them. In that way, this course is as much about developing critical thinking skills as it is an expository writing class. A course schedule appears on our laulima site. It will be your main source of information about assignment due dates. 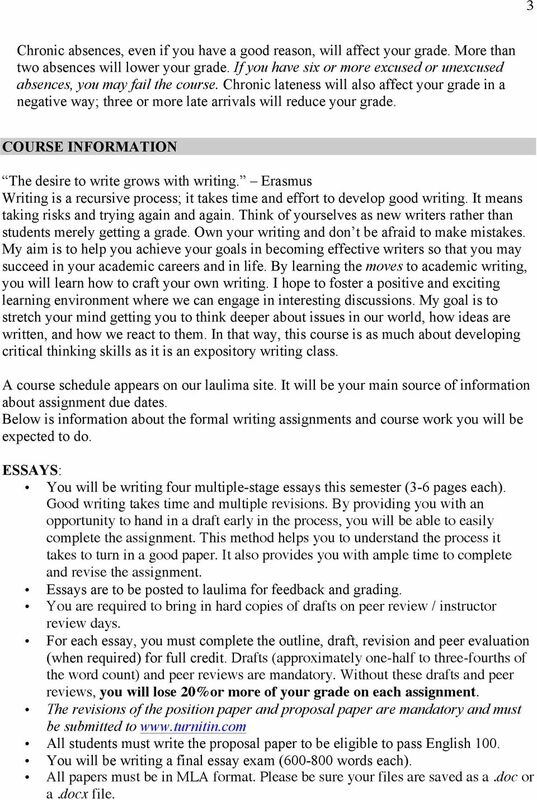 Below is information about the formal writing assignments and course work you will be expected to do. ESSAYS: You will be writing four multiple-stage essays this semester (3-6 pages each). Good writing takes time and multiple revisions. By providing you with an opportunity to hand in a draft early in the process, you will be able to easily complete the assignment. This method helps you to understand the process it takes to turn in a good paper. It also provides you with ample time to complete and revise the assignment. Essays are to be posted to laulima for feedback and grading. You are required to bring in hard copies of drafts on peer review / instructor review days. For each essay, you must complete the outline, draft, revision and peer evaluation (when required) for full credit. Drafts (approximately one-half to three-fourths of the word count) and peer reviews are mandatory. Without these drafts and peer reviews, you will lose 20%or more of your grade on each assignment. 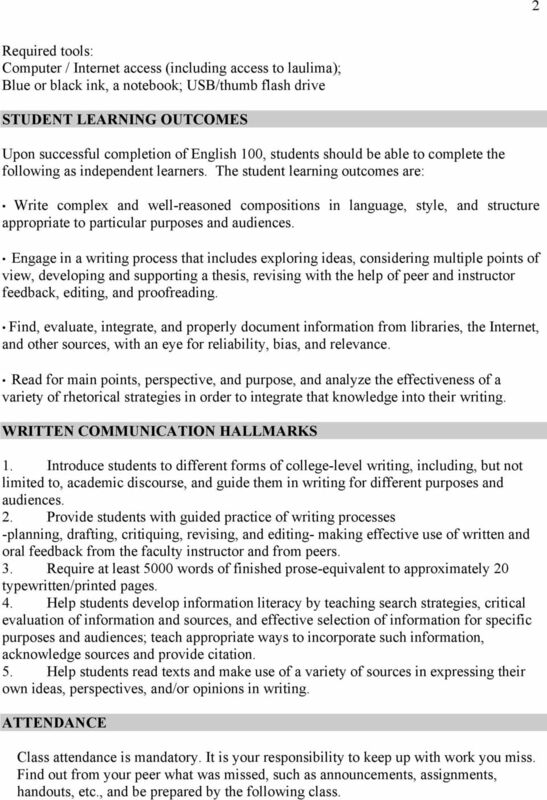 The revisions of the position paper and proposal paper are mandatory and must be submitted to All students must write the proposal paper to be eligible to pass English 100. You will be writing a final essay exam ( words each). All papers must be in MLA format. Please be sure your files are saved as a.doc or a.docx file. 5 5 COURSE ASSIGNMENTS ASSIGNMENT VALUE Attendance 10 Reading Questions 15 Five Grammar Quizzes (2 points each) 10 Essay 1 Narrative Paper 10 Essay 2 Comparative Paper 10 Essay 3 Position Paper 15 Essay 4 Proposal Paper 20 Final Essay Exam 10 CLASS POLICIES PLAGIARISM Plagiarism includes but is not limited to submitting any document, to satisfy an academic requirement, that has been copied in whole or part from another individual s work without identifying that individual; neglecting to identify as a quotation a documented idea that has not been assimilated into the student s language and style, or paraphrasing a passage so closely that the reader is misled as to the source; submitting the same written or oral material in more than one course without obtaining authorization from the instructors involved; or dry-labbing, which includes (a) obtaining and using experimental data from other students without the express consent of the instructor, (b) utilizing experimental data and laboratory write-ups from other sections of the course or from previous terms during which the course was conducted, and (c)fabricating data to fit the expected results. 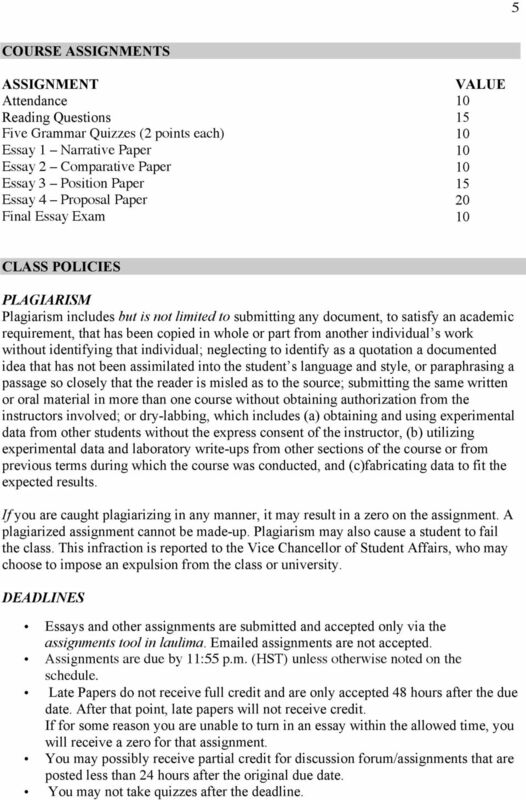 If you are caught plagiarizing in any manner, it may result in a zero on the assignment. A plagiarized assignment cannot be made-up. Plagiarism may also cause a student to fail the class. This infraction is reported to the Vice Chancellor of Student Affairs, who may choose to impose an expulsion from the class or university. DEADLINES Essays and other assignments are submitted and accepted only via the assignments tool in laulima. ed assignments are not accepted. Assignments are due by 11:55 p.m. (HST) unless otherwise noted on the schedule. Late Papers do not receive full credit and are only accepted 48 hours after the due date. After that point, late papers will not receive credit. If for some reason you are unable to turn in an essay within the allowed time, you will receive a zero for that assignment. You may possibly receive partial credit for discussion forum/assignments that are posted less than 24 hours after the original due date. You may not take quizzes after the deadline. 6 6 It is your responsibility to learn about and follow the official procedure for dropping classes. If you stop participating in this class but do not follow up to officially drop it, you will receive a failing grade. An Incomplete for this course is only considered when less than 10% of all coursework is left to complete and only under extreme circumstances. ELECTRONIC DEVICES Please turn off and put away cell phones and all electronic devices in your bag prior to the start of each class; if you text or use computers for personal activities during classroom time, you may be asked to leave and get a zero on a given assignment. I will respond to as quickly as possible. You can expect a response within 24 hours, except weekends and holidays when it may take up to 48 hours. EXTRA CREDIT If you are interested in earning extra credit, you must meet with the instructor during office hours to discuss this option. Extra credit is given only on a case-by-case basis and must be approved by the instructor. OTHER INFORMATION Library Learning Commons The Library Learning Commons (LLC) offers many free services for students. Content tutors can help with course concepts and study strategies for many subjects. Writing consultants can help with writing and reading assignments for any class. In addition, the writing center is available for one-on-one tutoring. 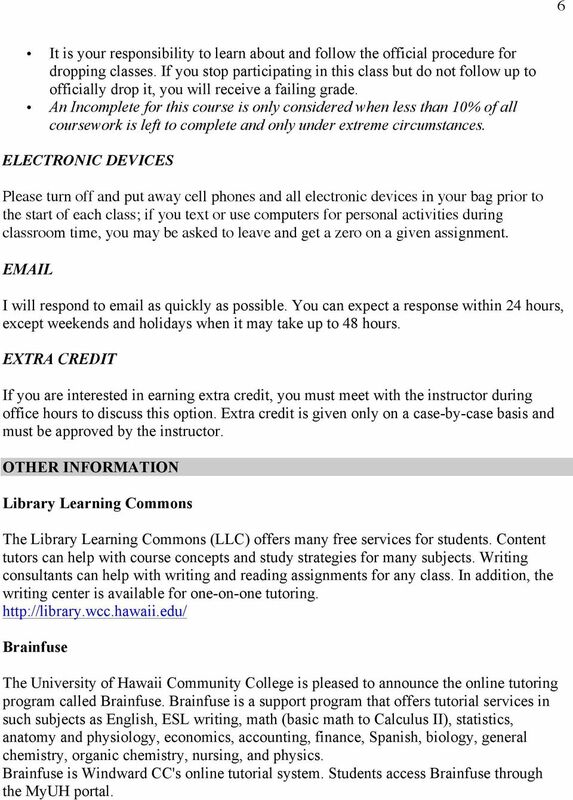 Brainfuse The University of Hawaii Community College is pleased to announce the online tutoring program called Brainfuse. Brainfuse is a support program that offers tutorial services in such subjects as English, ESL writing, math (basic math to Calculus II), statistics, anatomy and physiology, economics, accounting, finance, Spanish, biology, general chemistry, organic chemistry, nursing, and physics. Brainfuse is Windward CC's online tutorial system. Students access Brainfuse through the MyUH portal. 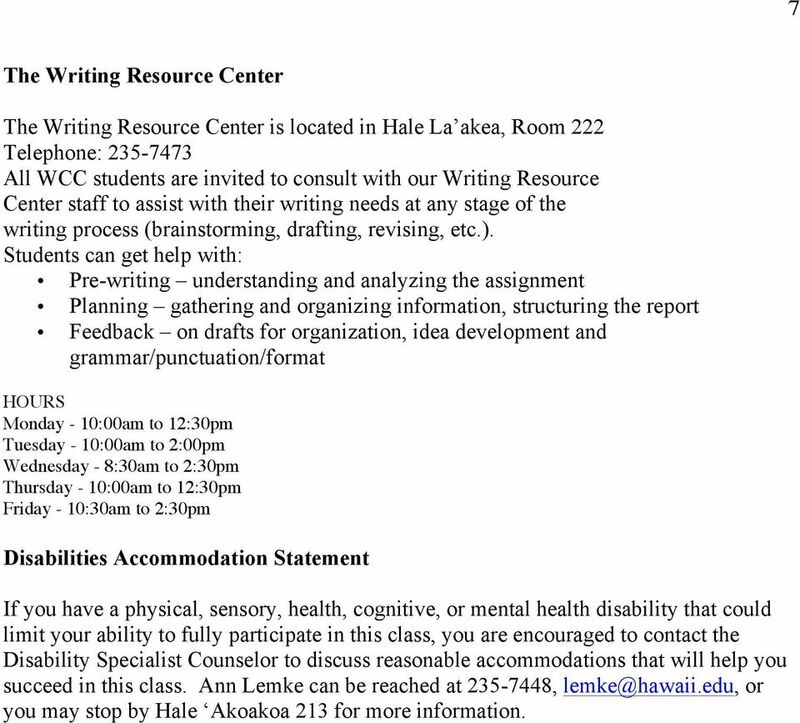 7 7 The Writing Resource Center The Writing Resource Center is located in Hale La akea, Room 222 Telephone: All WCC students are invited to consult with our Writing Resource Center staff to assist with their writing needs at any stage of the writing process (brainstorming, drafting, revising, etc.). Students can get help with: Pre-writing understanding and analyzing the assignment Planning gathering and organizing information, structuring the report Feedback on drafts for organization, idea development and grammar/punctuation/format HOURS Monday - 10:00am to 12:30pm Tuesday - 10:00am to 2:00pm Wednesday - 8:30am to 2:30pm Thursday - 10:00am to 12:30pm Friday - 10:30am to 2:30pm Disabilities Accommodation Statement If you have a physical, sensory, health, cognitive, or mental health disability that could limit your ability to fully participate in this class, you are encouraged to contact the Disability Specialist Counselor to discuss reasonable accommodations that will help you succeed in this class. Ann Lemke can be reached at , or you may stop by Hale Akoakoa 213 for more information. ENGLISH 22 INTRODUCTION TO EXPOSITORY WRITING (3 credits) INSTRUCTOR: Lance Uyeda OFFICE: Na auao 129 OFFICE HOURS: M-F 8:30-9:15 and by appointment. My appointment calendar is online at http://bit.ly/meetlance. WINDWARD COMMUNITY COLLEGE MISSION STATEMENT. Pre-requisites: High school chemistry or equivalent preparation, or consent of instructor. El Camino College/Compton Education Center Childhood Education Department http://www.elcamino.edu/academics/behavioralsocial/childhooded/index. History 100-06 LEC (85202) Introduction to Historical Skills Spring 2015. Dr. Jim Rose Office Hours: Tues. 2:00-4:00 and Thurs. This course will help the student to design and develop a research paper in the area of marketing.